Condensed soup is a canned variety of soup prepared with a reduced proportion of water. The consumer then adds water or milk and the mixture is heated. Condensed soup was developed by John T. Dorrance, an employee of the Campbell's Soup Company, in 1899. The advantage of boiling food in water as opposed to cooking it over an open flame is that it produces a denser food. Boiling several ingredients together causes the flavors to blend, thus creating a new taste. The practice of cooking meat in hot water dates to prehistoric times. Pots found from the Iron and Bronze Age excavation sites contain food residues. The Ancient Romans were known to eat a type of fish broth. Medieval cookbooks also included numerous recipes for soups. Robert May's Accomplished Cook, published in 1660, included recipes for "soops" with ingredients such as spinach, carrots, artichokes, potatoes, and parsnips. For centuries, soups were poured over toasted bread. In fact, the word soup derives from the same source as "sop," a piece of bread soaked in liquid. In earliest times, soup was served in a communal pot and the broth was drunk directly from the pot. This changed with the invention of the spoon in the fourteenth century. The practice of eating soup was not widespread in colonial America although there is some evidence that members of the upper and lower classes did enjoy it. In 1742 the first American cookbook was published in Williamsburg, Virginia by William Parks. It included recipes for "Soop Sante," "Pease Soop," "Craw Fish Soop," and "Brooth." German immigrants who settled in Pennsylvania introduced soups made from chicken, mutton, veal, beef, calf's head, rice, apples, and huckleberries. To the Pennsylvania Germans, soup making and eating was a ceremonious communal event. The arrival of French immigrants during the French Revolution furthered the popularity of soup. One such immigrant, Jean Baptiste Gilbert Payplat dis Julien, opened a restaurant in Boston in 1794 and became known as the Prince of Soups. Turtle soup was a specialty of the house. Soups soon began to appear in more American cookbooks. The Virginia House-Wife was published by Mary Randolph in 1824 and included 16 recipes for soup. It also included tips such as folding in butter and flour for a richer soup and using wine, tomatoes, cayenne, and curry powder for flavor. However, at the end of the nineteenth century, soup was still not eaten in the United States to the extent that it was in Europe, as John T. Dorrance found after he returned from studying chemistry in Germany. Dorrance's uncle, Arthur Dorrance, was an executive with the Joseph Campbell Preserve Company. At the time, the company was a produce cannery. John Dorrance found that there were only two companies in the United States that were canning soup. Franco-American and Huckens sold ready-made soups in half-pint, pint, and quart containers. The soups' size and perishability made them difficult to ship and a not-very-profitable commodity. Although compressing and concentrating soup into bouillon cubes was a common practice in France, the resulting soup was often lacking in flavor. Using his knowledge of chemistry, Dorrance set about to create a better condensed soup. He reasoned that by reducing half of the soup's water, the weight would be considerably decreased. His challenge was to create a strong stock that would hold its flavor when water was added to reconstitute the soups. In effect, Dorrance was creating a sauce. Within a year of embarking on his experiments, Dorrance introduced five varieties of condensed soup: tomato, consomme, vegetable, chicken, and oxtail. At first, Dorrance sold his soups door-to-door, working hard to convince American families that soup could be easily added to their daily diet. The ultimate success of Dorrance's innovation made the company profitable for the first time in its history, and in 1921 resulted in a corporate name change to the Campbell's Soup Company. Dorrance closely guarded his recipes by dividing them into two separate parts. One was the list of ingredients with specific weights and measurements. The other part contained the directions for combining the ingredients. The production process was also divided between two separate departments of the company's plant. A wide variety of foods and seasonings are used to make condensed soup. Meat, such as beef and chicken, is used to create soup stock and as an ingredient. Vegetables can include broccoli, cabbage, corn, green beans, lima beans, okra, onions, peas, tomatoes, and white potatoes. Grains include noodles, rice, and barley. Spices and flavoring include allspice, bay leaves, celery seed, cloves, curry powder, parsley, pepper, salt, sugar, and thyme. Flour and mashed sweet potatoes are used as thickeners. Water is used in the cooking process, but generally cancelled out by the thickeners. Vegetable and soybean oil are used as a coating agent to prevent spillovers during the cooking process. Worcestershire sauce is also used in condensed soups. It is made from anchovy essence, clover, garlic, malt vinegar, meat extract, molasses, shallot, sugar, and tamarind. Preservatives, such as monosodium glutamate (MSG), may be added to prolong the soup's shelf life. MSG is a salt derived from seaweed and vegetable proteins. The following process is for condensed tomato soup. Other types of condensed soups are made in a similar fashion. 1 Equal parts of lean beef and heavy bones are placed in 220-gal (833-1) iron kettles and covered with cold water. The meat is allowed to soak for 15—20 minutes before the heat is turned on. The water is slowly heated until it comes to a boil after approximately one hour. During this process, scum rises to the top. The scum is skimmed off regularly by mechanized long-handled skimmers and discarded. 2 The stock cooks for six to eight hours, until the meat is reduced to shreds. Water is added to keep the stock at a constant level. Spices are blended together and added to the stockpot. At the end of the cooking time, the stock is poured off. A screen in the bottom of the kettle traps the meat and bones. 3 Tomatoes that pass inspection and receive a grading of number one are loaded into hanging baskets and sprayed with water to remove dirt. After this initial washing, the tomatoes are conveyed to trays where they are inspected and washed again. 4 The tomatoes are fed into a hammermill, a machine with two sets of interlocking fingers. The hammermill crushes the tomatoes to pulp. The pulp is piped into 600-gal (2,247-1) steam jacket copper breaker kettles. The pulp is simmered in the kettles and stirred constantly. 5 The kettles are equipped with spouts. The cooked pulp is emptied through the spout into cyclone machines. Spinning blades in the cyclones force the pulp through a fine wire mesh that separates out the seeds and skin. The remaining liquid is piped into stainless-steel tanks and transported to the soup-making area. Seeds are saved for future plantings; skins are discarded. 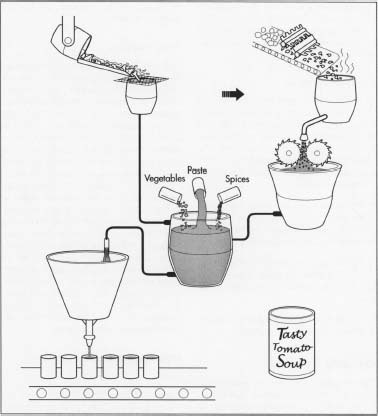 The manufacturing of tomato soup. 6 Proprietary amounts of celery seed, cloves, allspice, and bay leaves are poured into a kettle and covered with cold water. The water is quickly brought to a boil and allowed to boil for about 10 minutes. The seasoned water is drawn off through spigots and passed through several cheese-cloth with varying levels of thickness. 7 Flour and uncooked tomato pulp are combined in an industrial mixer until a paste is created. 8 The cooked tomatoes are piped from the stainless steel tanks into I10-gal (416 1)kettles. Raw pulp is gradually stirred into the kettle until the kettle contains 95 gal (360 1) of tomato product. Salad oil is then piped into the kettle. 9 Garlic and onions, which have been mechanically chopped, are mixed together and added to the kettle. Then the tomato paste is added. The liquid spices are added along with pepper, salt, sugar, and Worcestershire sauce. The soup is mechanically stirred during this process. 10 The soup is boiled for two to three minutes until the flour thickens. It is then drawn off through a spigot and passed through a cyclone machine fitted with a #16 iron sieve and paddle brushes. The paddles rotate at about 250 revolutions per minute (rpm). From the cyclone, the soup is piped through a brass wire screen. The wire screen is tightly woven, about 22 holes to an inch. As the soup passes through the screen, any black specks or other materials are sifted out and discarded. 11 The soup is now more similar to a thick sauce due to the lack of water, thus making the soup condensed. The soup is next piped to the canning section where overhead valves pour it into cans. The valves are set to release the same amount of soup into each can. The filled cans are then mechanically sealed. 12 The cans are conveyed to a tall, cylindrical steam cooker called a retort. There the cans are subjected to blasts of heat for about 30 minutes for sanitation purposes. 13 The cans are mechanically lifted out of the retort and placed on a conveyer belt. Water is sprayed onto the cans to cool them. 14 The cans are conveyed to the labeling station and labels are affixed. The the quality of ingredients in condensed soups is extremely important. Some companies, such as Campbell's, contract farmers to grow crops that are used in their products for quality assurance. Crops like tomatoes are processed as soon as possible after harvesting. The tomato pulp is processed at harvest and stored so that it may be used throughout the year. Certain companies also employ a staff of expert butchers to prepare the meat for stock and professional chefs who taste the soup throughout the manufacturing process. The United States Food and Drug Administration (FDA) enforces that many quality assurance steps are met. Any soups found to be harmful to the consumer are recalled back to the plant. Although the production of ready-make soups has improved and increased since the early days of the Campbell Soup Company, condensed soups remain popular among consumers. In the United States, 2.5 billion bowls of condensed tomato, cream of mushroom, and chicken noodle soups are eaten annually. Internationally, Campbell's tailors its soups to various cultures, making watercress and duck gizzard soup in China and cream of chili poblano in Mexico. The company also promotes the use of condensed soups as sauces in many recipes. A soup company must remain competitive in order to keep up with the consumer's tastes and price range. Today, more than one million cans of soup are used every day, and Campbell's has 67 varieties of condensed soup. Trends in genetic research may help to grow a larger amount of above average-sized vegetables for soups. This would increase the volume that the soup companies would put out, and perhaps decrease the price to the consumer. Collins, Douglas. America's Favorite Good: The Story of the Campbell Soup Company. New York: Harry N. Abrams, 1994. "History of Campbell's Soup." Campbell's Community Web Page. December 2001. < http://www.campbellsoup.com/center/history >. Smith, Andrew F. "History of Soup." Chef Talk Web Page. December 2001. < http://cheftalk.com/index.shtml >. Interesting, but how are the cans the soup is put into made?